Let me take you back seven years, when word first broke that the symphonic metal band Nightwish had hired a new lead singer - the former frontwoman of Alyson Avenue, Anette Olzon. And at that moment, the Nightwish fanbase split into three distinct parts. The first were the fans of Tarja Turunen, who were incensed that she had been fired and took a while to come around to the new singer, if they did at all. The second were pro-Anette, embraced the rougher, looser tone Nightwish took with their next two albums, and really enjoyed her more dynamic stage presence. And the third group - where I would count myself - realized that Nightwish had always been the brainchild of keyboardist and songwriter Tuomas Holopainen and the band was still capable of making great music regardless of the lead singer. And with that in mind, acknowledging the change in direction, I like music that was made by both incarnations of the band. Now fast-forward to October of 2012, where the news broke mid-tour that Anette Olzon had been dismissed from Nightwish and had been replaced by the female singers from tourmates Kamelot and later by Floor Jansen. I'm not going to get into the back-and-forth drama of the whole endeavour, but I will say this: from what I know of Tuomas and the way he runs Nightwish, I was disappointed, but not surprised. But just like Tarja had done ahead of her, Anette Olzon made the choice to strike out on her own and release a solo album - and I did not expect much. Let's face it, it took Tarja three albums to hammer out a working formula, and Anette had never been responsible for any of Nightwish's songwriting. Furthermore, the buzz was suggesting this album wasn't a metal or even a hard rock record like she made with either of her previous bands, so I wasn't sure what to expect. So how was Shine? Well, it's pretty damn good. 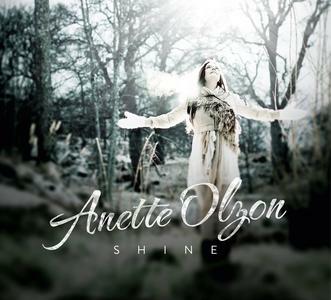 In fact, it was a pleasant surprise that given my expectations for this record, Shine by Anette Olzon turned out to be a fair bit better than I expected. And while it's not great, it's probably on par with Tarja's solo debut album My Winter Storm, and indeed shares a fair few things in common with that record, primarily in the lyrics and themes - albeit with a very different sound. And while I can't say it's better than any of the material she did with Nightwish, it's still good and worth your time. So okay, let's start with Anette Olzon - and honestly, I have no complaints. She's a great singer and I've always been a fan of her vocal delivery. She's always struck me as a very emotive singer, and that does this album a lot of favours when trying to convey the pretty complex emotionally journey she takes on this record. I guess if I were to have a complaint here, it's that most of her belting range is confined to the backing choral sections and the production there isn't quite as organic as I'd prefer, but really, in comparison with the bigger production issues on this album, that's fairly minor. Because if we're going to talk about a weak point on this record, the production definitely stands out. The percussion varies between live drums and stiff inorganic drum machines, the synth lines can feel a little watery and a little too electronic at points, and there are moments where the album feels a little more compressed than it should. But all of it pales to the electric guitar production, and here, whether it was a slip-up in the mixing booth or Olzon's choice, but the guitars feel absolutely crushed in the mix. And while I know she was going for a softer sound overall on this record, and it shows in how beautifully textured the acoustic guitars and strings are, but the harder guitars feel leaden and shoved to the back of the mix, only providing moments of sizzle on tracks that could have used a lot more guitar presence. The problem comes in the moments where we expect explosive payoffs of the crescendos from said guitars and we get nothing, which can lead to a real feeling of inertness on some tracks, the low point being the title track, which doesn't help the album's momentum. It doesn't help matters that some of the melodies are not stellar, especially near the beginning of the album with an excess of minor keys that never rise above sullen musings that recall bad Evanescence tracks. And then we just have odd tracks like 'Floating', which I think has a certain charm to it with the repeating synth line but I could definitely see a more organic melody choice working better. Frankly, the closer this album sticks to folk, the richer the sounds and the better the songs. Of course, this takes us to lyrics, and this is where I feel embracing the louder, more metal-inclined side could have helped this album more. Let's be honest, symphonic metal lyrics have a reputation for being terribly ridiculous or ridiculously terrible, and for a less-experienced songwriter like Olzon, it would have given her the excuse of bombast to excuse some of the weaker songs on this record - and folk/alternative rock tend to demand a higher level of lyrical quality. That said, Anette Olzon isn't a bad lyricist, and she makes the rough simplicity of her material work through solid delivery and decent technical songwriting. Furthermore, she's smart enough not to indulge in crazy hyperbole or histrionics, and keeps the record grounded in her emotional journey - which can easily be extrapolated to discuss her struggles now on her own away from Nightwish. And yeah, there's angst here, and the early moments of denial against that angst or escapism - in other words, the title track and 'Floating' - do feel a bit misplaced, especially considering all the minor tones in 'Shine' don't exactly make it a good self-esteem anthem. But where this album does shine is in the later moments of maturity, setting aside some of the angrier elements for moments of quiet maturity. 'Invincible', for instance, is a good love ballad that does feature an okay guitar solo, but it lacks a more powerful vocal performance from Olzon to really drive it past being just pretty solid. 'Moving Away' is bitter, but it does imply Olzon is moving on away from the tragedy, and it does build to one of the more satisfying crescendos on this album. And 'Watching Me From Afar' is probably the best song on this album, both by virtue of being the most organic and actually suggesting some closure in freeing her from her fears. What works about this is twofold - not only does it add a satisfying emotional throughline to the album, but it doesn't feel petty or leave lingering resentments on the table towards Nightwish in any definite form, and the fact that she chooses to opt for more vague storytelling works in her favour here. So in the end, I did enjoy Shine by Anette Olzon. It's not perfect, and there are definitely moments that feel a little amateurish and shaky, especially in the production, but for the most part the album sticks the landing. For me, it's a 7/10 and a recommendation. Once again, I'd have a hard time saying I like this album more than her material with Nightwish, but it's very different and it does work for what it's trying to be, and it's definitely worth a few listens. Check it out!